Photographers buy hard drives in external enclosures to keep up with the data they create with digital cameras and post-production software. When one fills up, another drive along with an enclosure is purchased. Before too long, there are several individual drives on the desk, each in its own enclosure. There has to be a more efficient way. Thanks to Drobo there is. Before I explain, there’s some background info. JBOD is an acronym for Just A Bunch of Discs. This is where all photographers, myself included, start. It makes sense. I certainly didn’t think I’d have a gaggle of disc drives holding all my photography. It just happened. One drive started getting full so I’d order a drive and an enclosure and keep working. It didn’t take long until I had a whole desk full of boxes hooked up to more little boxes to power the larger one connected by a spaghetti bowl of black cords. I looked at the cost of using JBOD. A reliable single drive enclosure with a fast connection to the computer today costs around $80.00 from OWC. The lead photo shows 4 of my last generation OWC drive enclosures that cost about that amount. A four-bay Drobo costs $300.00. 4 drive enclosures cost $320.00. JBOD offers no data protection. Drobo’s Beyond RAID provides protection even on a single drive. Let’s take a look at what a RAID is. RAID is an acronym for Redundant Array of Inexpensive Drives. Typically each of the four or more drive bays must be filled with identical hard drives in size, speed, manufacturer and model number in order to work. This means you have to buy at least one extra drive as a backup against one of the working drive going bad in the RAID. Believe me, buying five 6 terabyte drives is really pricey. Wouldn’t it be great if a RAID enclosure would work with a single drive to start with? Drobos come in three configurations: 4-bay, 5-bay, and 8-Bay. Any Drobo can work with just a single disc drive and still offer some protection. Let’s look at a 4-bay Drobo and how it works starting with a single drive. A Drobo loaded with only one hard drive will mirror the data on that drive. A 4-terabyte drive would have 2-terabytes of data in two places on that single drive. The provides protection should part of the drive become corrupt. While it’s not perfect protection, it is certainly better than a drive in a non-Drobo enclosure that offers no protection at all. Add another 4-terabyte drive to the Drobo. 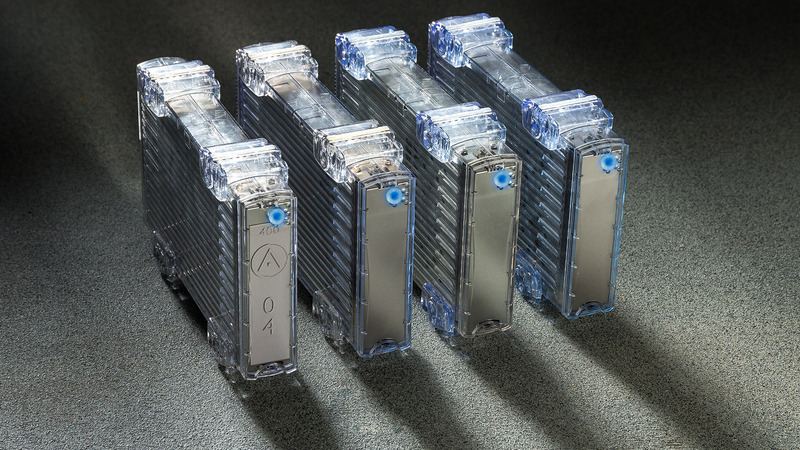 This doubles the available storage space from 2 terabytes with a single drive to 4 terabytes. Drobo automatically remaps the single drive to include the new addition. In the two drive configuration, each drive has a duplicate of the other. This adds a new level of protection. Now if one of the drives fails completely, all of the data still exists on the other drive. When a drive fails, Drobo turns the green indicator light next to the failed or failing drive to red. Add one more 4-terabyte drive to the Drobo enclosure. Protected storage doubles again from a total of 4 terabytes to 8 terabytes. When the third drive is added, Drobo becomes a full RAID 5 style storage device. If one drive fails, the two remaining drives can rebuild the failed drive’s replacement. Filling the last bay with another 4-terabyte drive increases the capacity of Drobo to 12 terabytes. As with the 3 drive configuration, 4 drives share the 12 terabytes of capacity among themselves. Once again, should any of the four fail, a red light will light indicating the bad drive. With Drobo running, simply pull the bad drive out, and replace it with another 4-terabyte drive or one of larger capacity. Protecting digital photographs with a 4-bay Drobo doesn’t cost more than a desk full of individual drives in enclosures. There’s a big advantage in the data protection offered by Drobo’s trademarked Beyond RAID technology. I’ve outlined the basics of how the 4-bay Drobo works as opposed to JBOD. There’s a lot more to the Drobo story. What I know is that I have been using Drobos since the second generation of the 4-bay model. I chose not to buy the first generation because is only had USB 2.0 connections. The second gen was firewire. The third gen is USB 3.0. I have never lost data. I have never had a Drobo fail. Currently, I have two second gen 4-bay units, two 5-bay Thunderbolt units, and two 8-bay models. One connects with iSCSI and the other is a Network Attached Storage version. I’ll be sharing more about Drobo in future posts. I welcome comments and questions on the storage solutions you are using. Nice article, and a great overview of how Drobo products protect your data and can scale out over time. I would like to challenge the assumption that a Drobo costs less than individual drive enclosures or JBOD enclosures. A Drobo can be cheaper than premium enclosures, but they enclosure market is so commoditized at this point that there are very inexpensive choices. Either of these are cheaper than the 4-bay Drobo. But that’s not why you get a Drobo. Where Drobo adds its value is in its incredibly good usability, ability to grow as you need more drive space, and redundancy against drive failure. In that sense the 4-bay version is an amazing value, and well worth paying for. It is not however cheaper than 4 standalone external drives or a more modest 4-bay JBOD enclosure. Drobo solves several problems, with a couple of small drawbacks. The part of a normal drive enclosure that is most likely to fail is the power brick, which are typically made as cheaply as possible. If you have multiple models and vendors of drive enclosures, you will need to keep them matched up, and possibly locate replacements with equivalent specs. Drobo’s power supply seems quite reliable (mine has been running for years), but if it goes down, all your data is unavailable. Likewise, if your Drobo fails, you will need to acquire another one to transfer your drives to. This is actually a better situation than with hardware RAID controllers, as you can migrate to the latest Drobo rather than searching eBay for a piece of esoteric and obsolete hardware. But it does mean that if you decide to migrate your data, you can’t wait until the Drobo fails unless you have another one handy. Performance of the Thunderbolt model (5D) is quite decent. I haven’t benchmarked the USB connection against the competition, but Thunderbolt is mostly a Mac solution: last I checked, the 5D is not supported over Thunderbolt on Windows. I have had failed drives that rebuilt easily and automatically when replaced, but I also had a strange corruption situation on the 5D that required help from Drobo tech support, and the installation of special firmware to recover. My first generation Drobo still runs fine, but no longer receives software support, so I have to run an older version of Drobo Desktop that is slightly unstable on Mac OS 10.10. If your needs go beyond direct attached storage, the NAS vendors like Synology and QNAP offer what I feel are more compelling feature sets. But you can’t beat Drobo as a way for normal people to get the benefit of redundant, expandable storage. 1. It is recommended you buy higher quality drives for RAID, either NAS or enterprise, rather than consumer grade. Unfortunately, these more expensive drives are not recommended for JBOD. 2. If you use RAID, except for RAID O, you lose capacity, which essentially costs you more money. We have a couple of older drobo pro units… these are connected over iSCSI. These are 8 drive arrays. At this size by default you are only “losing” 1 drive to parity meaning our 8 4tb array has almost 28tb capacity. Any one drive can fail and your data is safe. Drobo has the option to use 2 drive redundacy… meaning any 2 drives can fail and data is rebuildable. Second in our testing the drobos work fine with desktop drives. We are currently migrating one from 2tb wd caviar blacks to 4tb wd golds. Third drobos support SATA or SAS drives. You may think that if you want performance go 15000 rpm sas drives. In our case this isn’t the case… Testing a 15k drive connected directly to our server yielded 60% better throughput. But in our older drobo pro the sas drives only moved 4% more data. And that is using the iSCSI interface. This indicates the drobo’s raid controller and/or interface plumbing is the performance bottleneck… By comparison our enterprise IBM SAN passes every bit of the 15k performance to the connected servers. Of course it also cost 40k. Lastly managing a drobo can be drop dead simple… or frustrating as hell. For example our 8x2tb array started running short of space an it asked for a larger drive an indicated the bay with an LED. I ejected the 2tb drive and installed a 4tb drive and 2 days later it had rebuilt the array (it wasnt any bigger) it also immediately asked that the next drive be replaced… and 2 days later it had again rebuilt the array and the array and associated windows volume was 2tb larger… Easy peasy, any trained monkey can do it. Now for frustration you only need to look at what happened when I added the 2 old 2tb drives to the empty bays in our other drobo. Based on the first drobo I would have expected it to increase the size of the array and the associated volumes. No. Apparently when this array was created it was created as a fixed size and not simply “use all available space” so it will not grow without rebuilding it manually, which means copying all the data off, reinitializing the array from scratch, and the copying all the data back on… Similar devices from synology and others have more complicated tools but can handle these situations without starting over from scratch. Drobos are nice for their flexible drive support and simplicity. Performance and granular control is lacking.